When I was a young lad, the two great industrial research laboratories were Bell Labs and GE Labs. Today, a few companies that have more money than they know what to do with are redefining and coalescing what “industrial lab” and “think tank” mean. Take Google, for example, with its Google [x], better known as Google X, an almost-secret think tank for coming up with “moonshots,” those highly speculative (read: unlikely), expensive, scientific/technological bets that could bring about a major advance in the human condition. 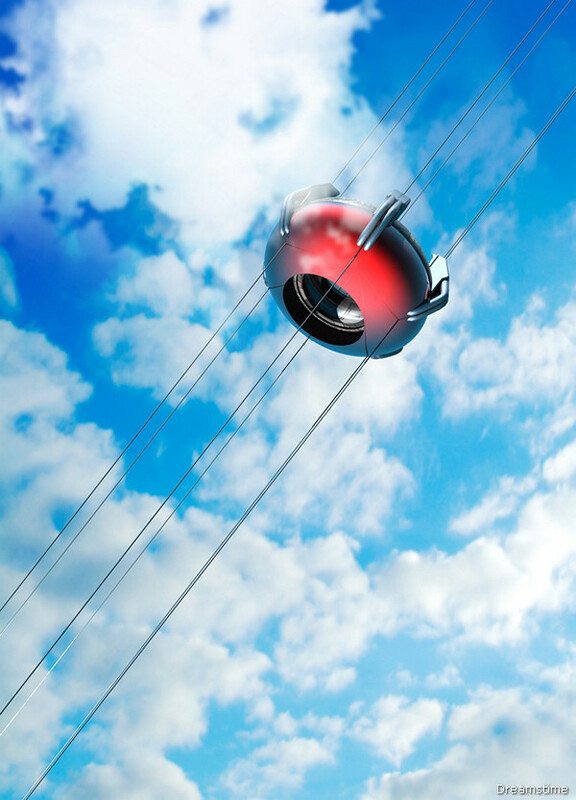 It was amusing to read in Fast Company that Google X had reviewed the old idea of a “space elevator,” an inexpensive way to transport people and payloads into the heavens. They’re also known as beanstalks, skyhooks, space bridges, space lifts, space ladders, orbital towers, or orbital elevators. Back in 1895, the eccentric Russian theorist Konstantin Tsiolkovsky proposed a free-standing tower from the Earth’s surface to the height of geostationary orbit, about 22,239 miles (35,790 kilometers) up. Later, scientists such as Yuri Atsutanov (1959), the team of John D. Isaacs, Allyn C. Vine, Hugh Bradner and George E. Bachus (1966), and Jerome Pearson (1975), reformulated the idea as lowering a superstrong cable from a geostationary satellite and counterweight to an equatorial base site on the Earth’s surface (which will line up with geostationary orbits directly overhead). Scientist/novelist Arthur C. Clarke made a space elevator the centerpiece of his novel, "The Fountains of Paradise," in 1979. Although many materials are stronger in tension than compression, it wasn’t until 1999 that engineer David Smitherman of NASA realized that the recently-developed carbon nanotubes might be strong enough to build a tether for a real space elevator. Around this time, Bradley C. Edwards thought of using a paper-thin carbon nanotube ribbon as the main support structure. Unfortunately, even if you could easily manufacture carbon nanotubes longer than a few feet (you can’t as of yet) they are fragile and break easily. All of this hasn’t stopped the formation of a Japan Space Elevator Association and a 2012 announcement by the Obayashi Corporation that it could build a space elevator in 38 years using carbon nanotubes. Perhaps we could settle for simply wanting to build something tall enough to get above the Earth’s atmosphere — 100 miles, say — so as to use rockets to accelerate into space without encountering air resistance. In that case, a simple cone or pyramid shape of shallow slope could achieve that height, as the 29,035-foot or 8,850-meter (m) pile of rock, dirt and snow called Mt. Everest attests. Of course, that measurement is taken from sea level to the top of the mountain. In reality, the tallest mountain from base to peak is one of Hawaii’s volcanos, Mauna Kea, which rises only 13,796 feet (4,205 m) above sea level, but its total height from the Pacific Ocean floor is an impressive 33,476 feet (10,203 m). In terms of a space elevator discussion, however, we should look to Mt. Chimborazo in the Andes of Ecuador, which extends farther from the Earth's center than Everest's because of the equatorial bulge produced by the centrifugal force of Earth’s rotation. This bulge lengthens Earth's radius about 68,900 feet (21,000 m) compared with the distance from Earth’s center to the poles. It’s amusing to think that Ecuador’s beaches are 39,862 feet (12,150 m) farther from the center of the earth than Mt. Everest’s summit. In any case, thanks to the equatorial bulge, although Mt. Chimborazo’s summit may have an elevation above sea level of only 20,564 feet (6,268 m), its true “height” — if you sliced off the mountain and the underlying bulge as one piece and placed it next to Everest — is about 89,462 feet (27,268 m), its summit extending 60,426 feet (18,418 m) above Everest’s. Were Hawaii’s Mauna Kea placed on the equatorial bulge, its summit would extend 73,337 feet (22,353 m) farther into outer space than Everest’s, for a total “height” (compared to the surface of a perfectly spherical Earth) of 102,372 feet (31,203 m), or a little over 19 miles, many miles too short for the serious mass-transport of people and goods into outer space. Moreover, winds and simple temperature fluctuations can be a major problem, as seen in the cracking, movement and eventual structural failure of the outer cladding of the pyramids of Egypt. Take the Bent Pyramid of Pharaoh Sneferu, situated about 25 miles south of Cairo. When subjected to an average daily temperature fluctuation of 67°F (37°C), limestone’s coefficient of thermal expansion ensures a movement of the pyramid’s blocks of 30mm (1¼ inches) of movement per 100-meter (328-foot) run in all directions, as calculated by structural engineer Peter James. Perhaps the best, though most obscure space elevator idea was presented by the Russians in the 1960s and 1970s involving “holding the tower up with electricity.” It appears they may have envisioned a lattice structure reaching into space that would be reinforced not by futuristic materials but magnetic fields. In any case, don’t expect to take an elevator trip into space any time soon. It’s doubtful that Google [x] will make any major progress regarding space elevator R&D in the near future. Personally, I’d rather see them slap a sensible user interface on Gmail.